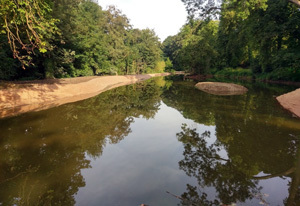 Erosion is inevitable on almost all watercourses although on most waters can be significantly reduced by careful planting, plant management, fish management and maintaining consistent water levels. Where erosion has started to become a problem, it can, if caught in time, be resolved quickly with minimal cost. 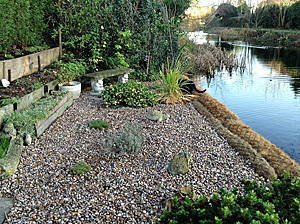 On most water courses erosion can be remedied by ensuing a robust planting scheme using the right plants for the location. Marginal plants are uniquely adapted to reduce erosion by absorbing the energy of waves with their leaves and by stabilising the banks with their extensive root systems. Erosion can be best prevented by early intervention and a good robust inspection regime as offered by Aquaserve Management Limited will identify erosion at an early stage to allow preventative work rather than it is becoming expensive restorative work. There is a vast and growing number of materials and mediums that can be used to resist and reduce erosion as diverse coir rolls, coir pallets, geogrids and coir carpets. In more extreme cases it may be that bank restoration will be required with more robust materials including Nicospan rock rolls, coir rolls and gabions to name but a few. All these differing materials offer their own unique qualities and limitations and we are well placed to advise on the most appropriate for each application. Our experience in resolving erosion problems as well as a good understanding of the legal requirements and restrictions whilst working on rivers, streams and canals mean that we can offer solutions tailored to suit your watercourse, budget and timescale. If you have any concerns regarding erosion on your water course please speak to us at the earliest opportunity, erosion can quickly escalate and early intervention is significantly cheaper than mostly bank restoration.